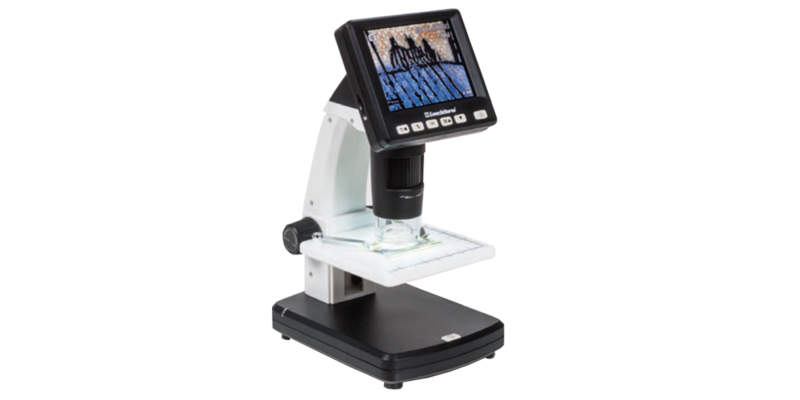 With its built-in 3.5" LCD screen, this digital microscope is easy to use and is suitable for a variety of applications, making it possible to analyse even the smallest details on stamps, coins, or bank notes. Superb image sharpness thanks to a 5-megapixel camera, 8 LEDs and adjustable focussing . Up to 500X magnification thanks to 4X digital zoom. Photos and videos can be saved onto a 4 GB MicroSD card (included) and viewed on a PC or TV. Images can also be viewed on your PC via a USB 2.0 connection or using the AV output on your TV. The 5-megapixel active pixel sensor, the 8 LEDs for illumination, and the adjustable focusing ensures excellent definition and crystal-clear images. The 4x digital zoom enables up to 500x magnification. Save your photos and videos on the 4 GB MicroSD card included.The rechargeable Li-ion battery means that you can take this microscope with you wherever you go and you are no longer bound to a plug socket or computer. The software included features a calibration function for exact measurement of distances and areas of the magnified objects and is quick and easy to install. The LCD digital microscope is ideal for a whole host of uses, whether for study, school, or leisure, and enables detailed observation of stamps, coins, banknotes, minerals and more. Suitable for all current computers. Li-ion battery for portable use. It doesn't have to be plugged into a PC or laptop. The software, features a calibration function for exact measurement for enlarged objects, is quick and easy to install. Ideal for a whole host of uses, whether for study, school, or leisure, and enables detailed observation of stamps, coins, banknotes, minerals and more. Overall size: 105 x 230 x 150 mm (4 1/8 x 9 x 5 7/8"). Suitable for all current computers running Windows XP / Vista / Win7 / Win8 / Win 10 / Mac OS 10.6 or later (measuring software only works with Windows).